In Medieval Europe books were a precious commodity. 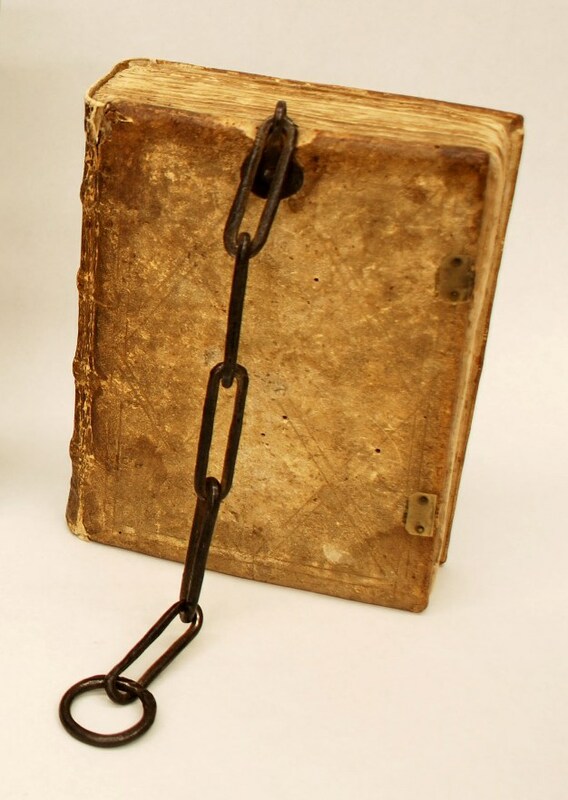 Books were hand-copied manuscripts, and might be fashioned with metal hardware to chain them to a bookcase or desk to protect them from theft. This book is a bound manuscript likely from Germany, dated circa 1370. The text is Sermones de sanctis (call number: MS D84), writings of Frater Soccus, a monk from the Cistercian order. The pigskin binding, tooled all over the covers, has a chain attached to the back board at the top. Storing this on a modern shelf created problems, as the chain drapes down the back cover and makes it impossible to place another book next to it. To allow for proper shelving, I created a clamshell box made from blue corrugated cardboard. This board has a pH of above 7 (is “alkaline”) and is designed to protect materials as they age and degrade. Inside the clamshell I used another corrugated board (this time gray) with a channel cut to guide the user to place the book in the box. There are directions on the outside of the box if a user is unsure how to return it to its box, which is a fast and easy structure to complete. 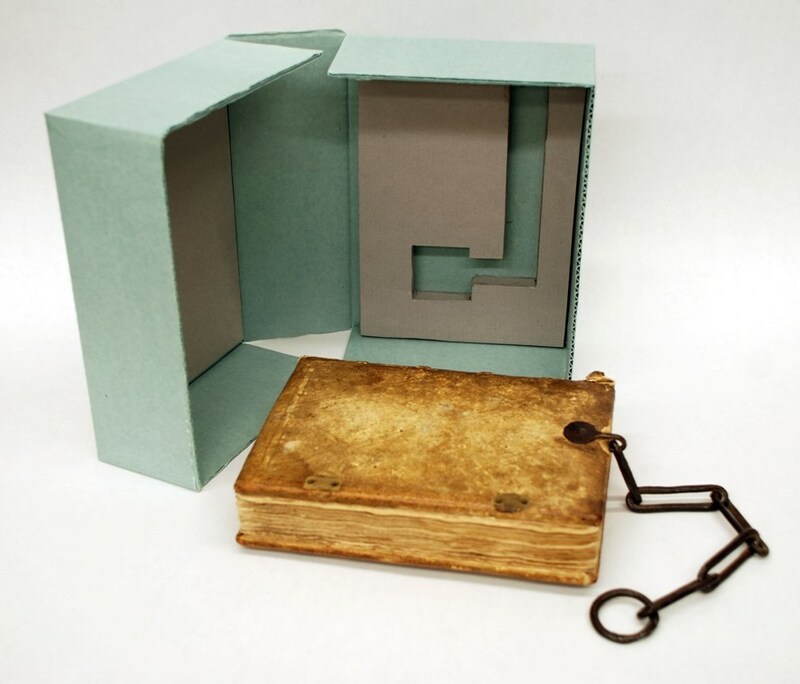 To learn more about chained bindings, see Henry Petroski’s The Book on the Bookshelf, housed in KU’s Watson Library (call number: Z685 .P48 1999). 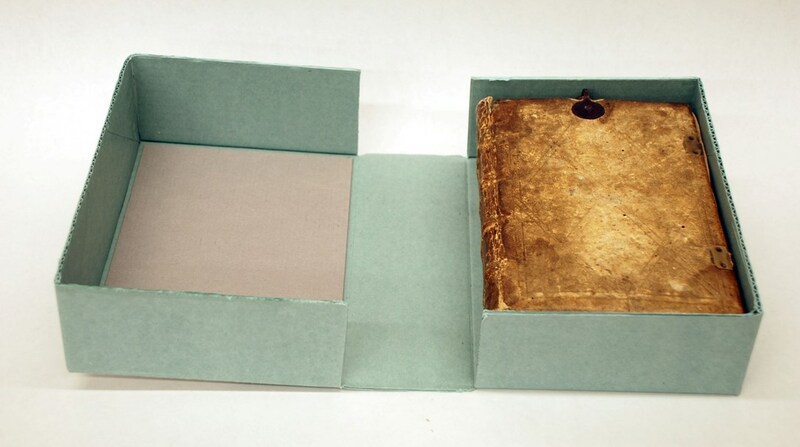 This entry was posted on Tuesday, May 22nd, 2012 at 9:04 am and is filed under Conservation, Special Collections. You can skip to the end and leave a response. Pinging is currently not allowed.